I recently came to the conclusion that I am truly immersed in mommyhood, when the success of my dinner is determined by my 3 year old asking for his third helping of dinner. Some women may hold their breath and sneak quick peaks at their men, trying to gauge by their expression if they like dinner or not; Not I. With the picky palate of a 3 year old, success is when he eats more than 3 bites of the food I painstakingly - or sometimes sloppily - prepared for him. Of course, I have learned to keep my eyes on my own plate of food, for if the little prince even suspects that I am watching him...dinner is over. So what was it that a preschooler embraced so heartily? Creamy Beef Linguine...or worms as the kid called it. Dinner was the result of my husband asking for some kind of pasta, because he was tired of plain meat, and me rummaging through my pantry to see what I could throw together. I felt sort of like a witch cooking a mysterious brew over a cauldron - minus the ugly wart and pointy hat - with all the odds and ends I threw in. It turned out pretty tasty though, something that I would even heat up and eat leftovers of. Heat a large skillet over medium high heat. Add the ground beef all at once but do not stir at first, this allows the beef to form a crispy golden brown exterior. Season the top side with seasoned salt, to your own tastes. When the bottom side of the meat has turned golden brown, flip it over and season the new side with season salt. Cook the meat until done, and set aside. Heat milk and broth together in a microwave, or on the stove. Set aside. In a medium pot cook the linguine until done, according to package instructions. While the pasta is cooking: In a large skillet over medium-high heat add the butter, then turn down to medium heat and let the butter melt. Add the onion, garlic, salt, and pepper, and saute until the onions are soft. Whisk the flour into the butter mixture, until it turns golden. Pour in the hot liquid and whisk vigorously until there are no lumps. Stir occasionally until the sauce thickens. Add the parmesan cheese and sour cream, and stir until the cheese melts. Add the cooked beef and stir to mix. Remove from heat. Place the cooked linguine on a serving platter, then pour the beef sauce over the pasta. Serve immediately. Enjoy! 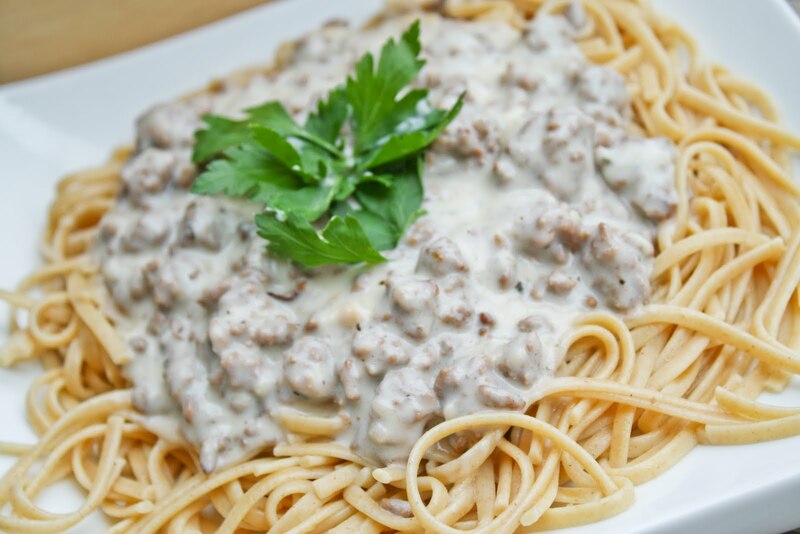 Tip: Heating the milk before adding it to the flour helps to prevent lumps in your sauce. I'm so impressed that you came up with your own recipe! And that your three year old loved it :) way to go! This plate of worms looks terrific and comforting! My picky eater would love this.Thanks for sharing your recipe.I saw your blog from the foodie blog roll and I like what you have here.if you won't mind I'd love to guide Foodista readers to this post.Just add the linguine widget to the end of this post and it's all set, Thanks! 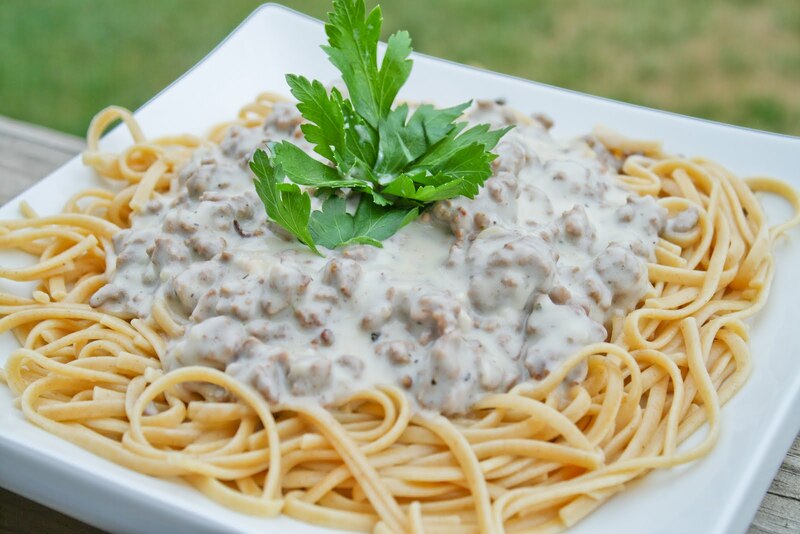 Looks like a variation of Hamburger Stroganoff with Parmesan added. Delicious.